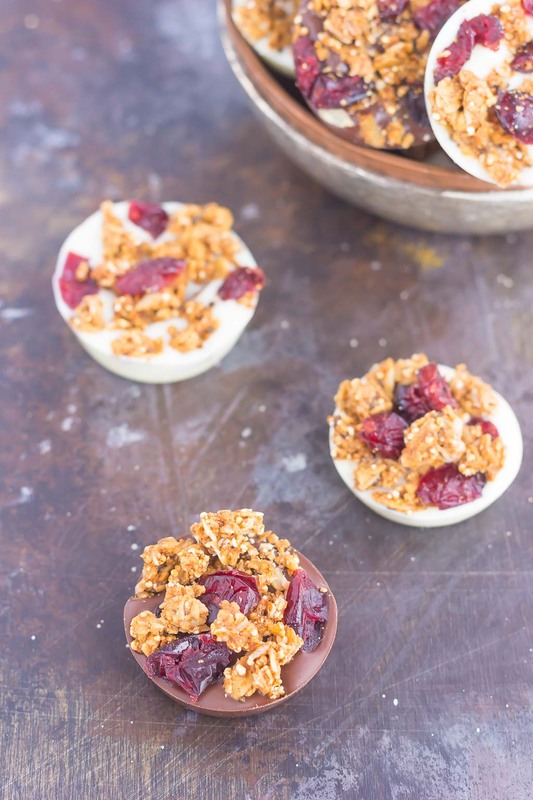 These Chocolate Cherry Granola Cups are the perfect bite for when you want something sweet. 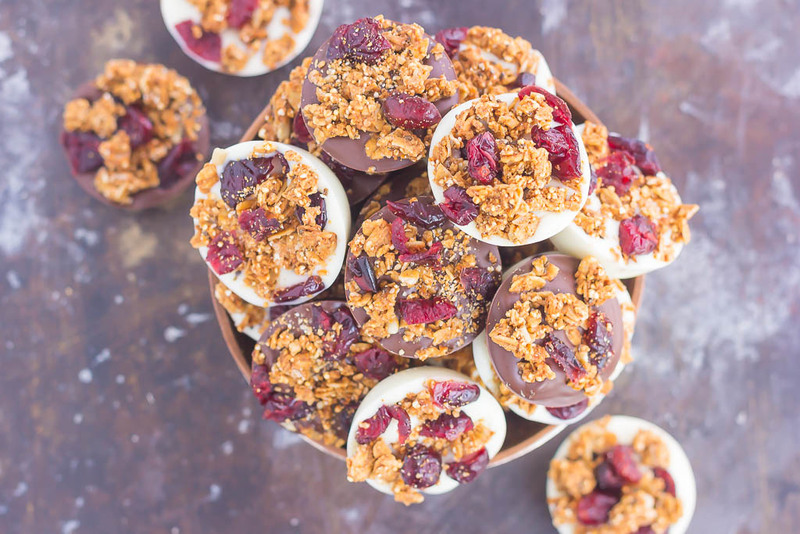 Smooth dark chocolate and creamy white chocolate cups are topped with crunchy granola and dried cherries. With no oven needed and ready in minutes, these cups make a delicious dessert or snack! Time to get your fill of something bite sized and filled with chocolate! Sometimes I get the best recipe inspiration when I’m lying in bed at night. I’ve always had trouble falling asleep because my brain goes into overdrive and it’s my time to think. I think about everything and anything under the sun sometimes, and it’s a curse in my eyes. The hubster, on the other hand, can fall asleep in about 10 seconds…and I’m not kidding! We’ll be talking when we get into bed and then a few seconds later, he’s off in dream land. How does he do that?! And why can’t I be like that? It also doesn’t help that the we are both extremely light sleepers, too. If one of us gets up to go to the bathroom, then the other wakes up, and vice versa. I honestly can’t remember the last time I’ve slept straight through the night. And for all you parents out there, I’m sure you’re just shaking your head at me. Anyway, now that I’ve gone off on a tangent, let me get back to the point. 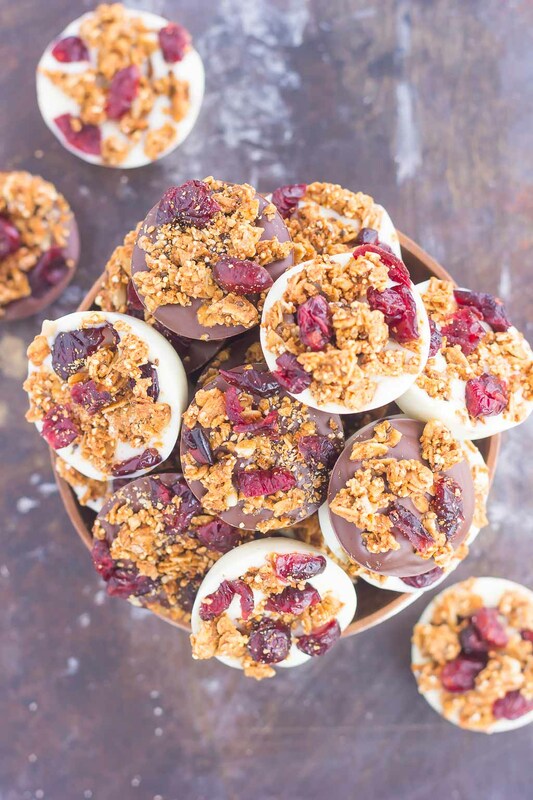 These Chocolate Cherry Granola Cups! As I was struggling to fall asleep awhile back, this little sweet treat popped into my head. 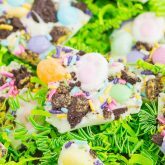 Similar to a chocolate bark, but bite-sized and poppable. And the best part was that I already had all of the ingredients that I needed to make this sweet treat. I mean, white chocolate, dark chocolate, granola, and dried cherries. It really can’t get any easier, friends! And trust me when I say that these cups are easy to make, friends. I was hesitant to even call this a recipe, it’s just that simple. But, since easy deliciousness is the name of my game, I knew I had to share this with you. The melted chocolates are poured into mini muffins tins (I used this silicone kind for easy removal) and then topped it with granola and dried cherries. Let it set in the refrigerator for 15-20 minutes and then pop the chocolates out of the time. Easy peasy and oh-so delicious! 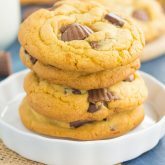 I like to use Ghirardelli Dark Chocolate and White Chocolate Melting Wafers for melting (and drizzling or dipping) chocolate in all of my recipes. It’s easier to melt, takes less time than melting regular chocolate/white chocolate chips, and has a better taste, too! 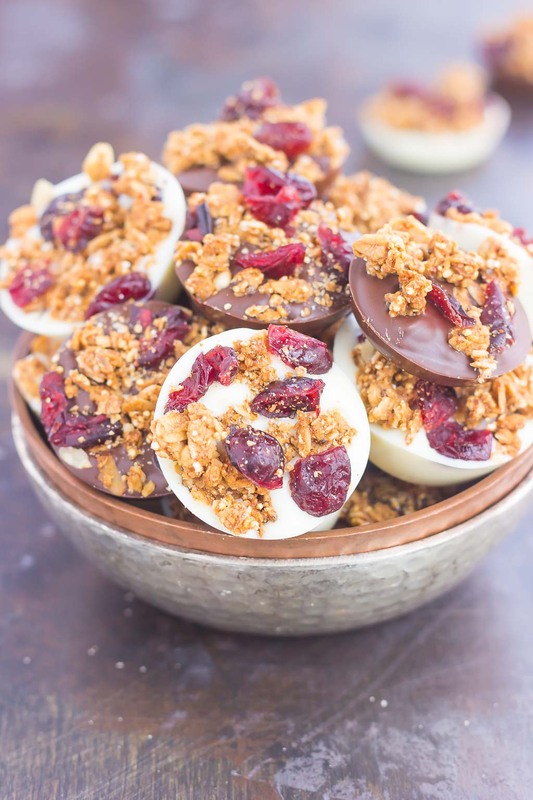 I do recommend using a silicone mini muffin pan for these Chocolate Cherry Granola Cups. That way, you can literally pop the chocolate right out of the pan. Otherwise, it might require a bit more effort to get the cups out of a regular metal pan. The combination of the chocolate, the crunchy granola and sweet cherries make the most delicious combination. Whether your team dark chocolate or team white chocolate, I guarantee you love these little granola cups. And you can even customize them depending on your tastes. I love keeping a bag of these in the fridge (and freezer!) for when my sweet tooth hits. It’s just the right amount to cure my cravings and tastes so delicious, too. So what are you waiting for? 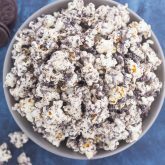 Grab that chocolate and whip up this easy treat today! 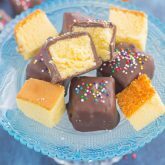 Looking for some more easy desserts? I’ve got you covered! In a medium bowl, melt dark chocolate wafers/chips on medium power in microwave, stirring every 15 seconds so it doesn't burn, until smooth. Spoon about 2 tablespoons of melted chocolate into 12 mini muffin cups. Top each cup with granola and dried cherries. Repeat process from step one, using white chocolate wafers/chips. Refrigerate cups for about 15-20 minutes, or until chocolate is hardened. Remove from refrigerator and remove cups from each tin. Cups will keep either at room temperature or in the refrigerate or freezer for several weeks. These look fantastic! They will make the perfect snack! Need to make them asap! I'm with you -- my mind races with ideas when I'm trying to go to sleep OR when I wake up in the middle of the night which is often. It ain't easy but I have had some of best inspiration during those times. :) These little bites are my idea of the perfect snack -- I love these! 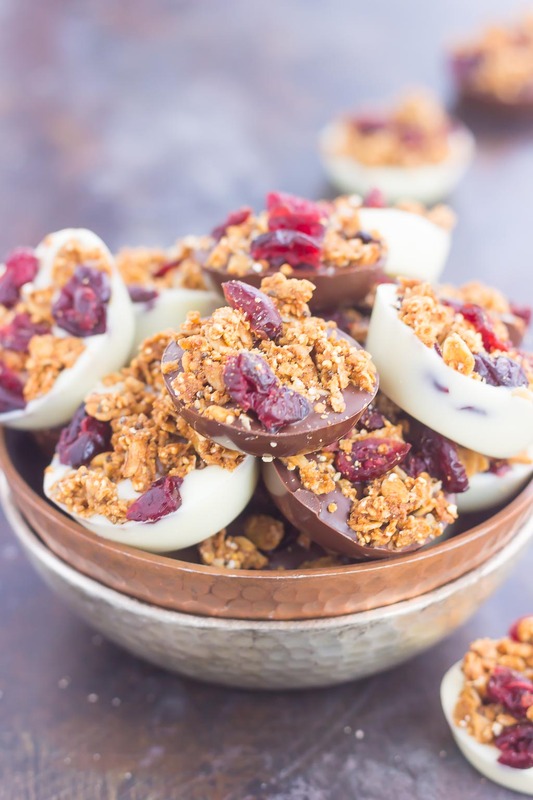 Chocolate combined with crunchy granola and tart cherries sounds like a great combination and I can't wait to try them! Isn't that the worst? Thanks for the sweet comment, friend! haha my sister is like that - she literally can fall asleep at the drop of a hat. It makes me so jealous!!! ANYWAY chocolate + cherry is just the best combo! These sound delicious! It's so not fair! :) Thanks for the sweet comment, Ashley!